On April 8, 2000, the Issaquah Police Department had its grand opening and ribbon cutting at the new police station. Newscaster Tony Ventrella was Master of Ceremonies, and he brought two wonderful female singers to sing the National Anthem. Mayor Ava Frisinger and Chief of Police Dag Garrison both gave inspirational speeches regarding the new station. Following the ribbon cutting there was a reception and tours of the new station. The evening ended with the jailhouse rock dance, which was a lot of fun and well attended. The weather outside could not have been more beautiful for the occasion. The ideals and goals of the Issaquah community were taken into account when developing the new Issaquah Police Station, which was designed by Easters and Kittle Architects and officially opened in 2000. A citizens committee met to determine priorities for the building design. One of the group’s goals was that the final building should blend into Memorial Park and allow for a public gathering area. This concept inspired the plaza on the north side of the building, as well as the spacious community room rotunda. 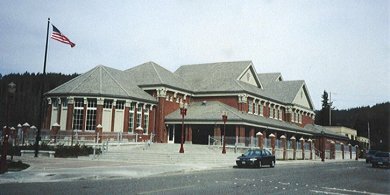 Architects note that many police stations can appear foreboding; this police station was intended to welcome the community and make them feel included and welcome. From left to right are Mayor Ava Frisinger, Chief of Police Dag Garrison and City Council President Fred Kempe, cutting the ribbon at the opening of the Issaquah Police station. (Photo courtesy Barb Justice, 2000). From eft: Mayor Ava Frisinger, Congresswoman Jennifer Dunn, Chaplain Chris Widener, Police Chief Dag Garrison, Deputy Chief Dave Draveling and architect Carl Easters. Citizens also felt that it was important for the building to orient itself to the public walkway, reinforcing the feel of a commons stretching from one end of the downtown to the other. As you can see, the sidewalk and garden next to the building fall naturally along the pedestrian walkway that stretches from the railroad depot to the Community Center. Project architects also enhanced the historical character of the building by including brackets around the eave lines and windows, utilizing brick, and adding divided lights and some trim-work in the lobby. This is the fourth police station and sixth jail in Issaquah. You’ll be able to visit the second jail when you stop by the Gilman Town Hall, and the site of the first when you visit the Masonic Hall. I gave careful consideration in the design of this art piece. I feel this monument must not only have a “Northwest” flare, but it must also reflect the spirit of Issaquah and our dedication to the preservation of our environment… I chose the Bald Eagle as my main subject for two reasons. First, it is our National bird and represents freedom and power. The second reason is because the eagle has made an incredible comeback and is recognized as a Northwest icon. Another bit of criteria that had to be met was tying the sculpture to the City of Issaquah. I feel I’ve accomplished this by having the eagle grasping a salmon from the water. With the newly remodeled salmon hatchery just two blocks away, it makes for a perfect compliment. The salmon is supported by a water “splash”. Water is also associated with Western Washington and also represents the life-giving force of nature. Imprinted into the bronze water are impressionistic human hands. This accurately represents our dedication to the preservation of the environment by literally showing that nature is in our hands. Lastly, there is a “twist” in the body posture of the eagle. One of its talons will have lost its grip on the struggling salmon, causing the great bird to be slightly off balance and leaving the viewer uncertain as to the outcome in this struggle for life. I feel this will capture our human struggle to give 100% every day and in everything we do. At the same time it is a sobering reminder that there are no guarantees in life, all we can do is try. 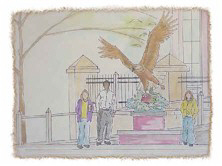 Doug Eck, artist, has lived his life within the Issaquah community and is a 1980 Liberty High School graduate. His work can be found throughout the United States. Special thanks to the Issaquah Arts Commission and the Police Facility Art Selection Committee for their dedication in selecting, purchasing and placing this beautiful piece of art here in Issaquah. It’s presence at the Police & Jail facility will add to the charm and character of this unique building.